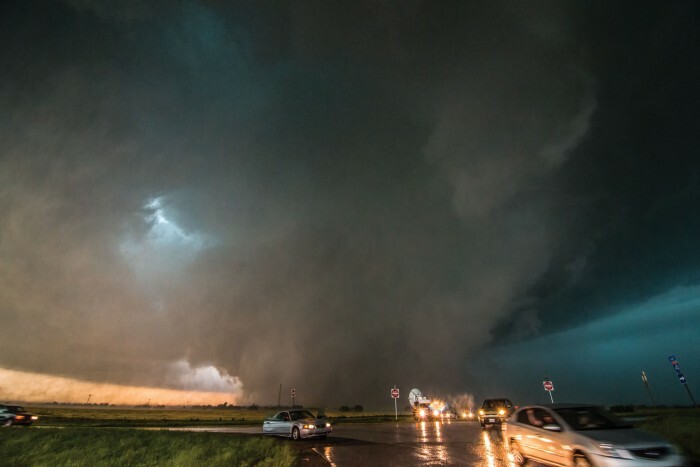 May 31, 2013 — The Weather Channel meteorologist Mike Bettes and his crew were in El Reno, Oklahoma, chasing an EF-5 monster tornado, when it unexpectedly turned and headed right for them. And “monster” doesn’t do it justice. With wind speeds estimated at 296 mph — just shy of the world-record 301-mph tornado that hit nearby Bridge Creek-Moore in 1999 — and the widest tornado ever observed in the U.S. at 2.6 miles wide, this was a truly terrifying storm. Within seconds, the full fury of the twister was upon them, tossing their Tahoe through the air. When it hit the ground 200 yards away, the seat-belted crew had miraculously sustained injuries they could walk away from. Others were not so fortunate, including a three-member veteran storm-chasing team from the Discovery Channel, who were among 18 who lost their lives that day. Such accidents are extremely rare among the professionals who work every day to prepare and protect the rest of us, but the hazards of covering the worst Mother Nature has to offer are very real. Leverette’s job is to make sure the popular channel is widely broadcast when and where viewers need it. And in the midst of tornado season, visiting family in Florida, and juggling a two-year-old, days working in her car during her Atlanta commutes aren’t uncommon. When she gets to work, it’s at The Weather Channel’s modern eight-story building in north Atlanta. Even for Leverette, who has been with the station since 2012, knowing nationally recognized personalities like Sam Champion or Jim Cantore are just downstairs in the first-floor live studio still feels a little surreal. Alana Leverette with meteorologist Jim Cantore in the studio. Photo by The Weather Channel. But Leverette fell in love with telecommunications and marketing when she took an administrative job in the cable industry, and she hasn’t looked back. And while she fell into her job at The Weather Channel by happenstance while following one of her mentors, it’s become her dream position. During Superstorm Sandy, Leverette recalls that senior meteorologist Stu Ostro, who consults with the U.S. military on weather patterns to prepare troops for deployment, blogged about where the storm was likely to hit. Leverette had her own up-close and personal experience of a high-stakes weather situation during last year’s Atlanta ice storm. TWC was predicting that the wet snow would soon turn to ice, but it couldn’t predict how city officials would respond. Like thousands of Atlantans, Leverette left work early and found herself stuck in gridlock for hours. “It took me nine hours to get home,” she said, finally reaching her husband and toddler son by midnight. But thanks to The Weather Channel’s emphasis on emergency preparedness, she was better prepared than many of those camped out on Atlanta’s highways. Not only had Leverette made sure to gas up as she was leaving the office, but her phone was charged, and she had snacks and water in her car. So her ice storm story involved a cozy few hours checking up on family and friends, with plenty of heat and food and water. Leverette’s co-worker, on-air personality Alex Wilson, was at home during the ice storm. Her shift had ended at 10 a.m., and after a quick run to the grocery store, she saw cars starting to get stuck behind her house on Powers Ferry Road. The next morning, she was supposed to fly out to cover the Superbowl, but when the roads were still closed, she called in to see if the station needed help. She walked the two miles to work, meeting up with Mike Bettes on the way. At the station, a shell group was still on air, having slept at the station overnight. Wilson pulled her high heels out of her backpack, did her own makeup, and for the next six hours, pitched in. “It was quite an event — a perfect series of events and conditions that led to a huge mess for a couple of days,” she said. Wilson’s first role at TWC was in 2013 as a co-anchor with Jim Cantore on “Weather Center Live.” Like Leverette, she admits that when she first walked in the door, she was star struck. “But they’re [all] really the same on TV as they are in person,” she said. “There’s no showbiz to them.” Still, it’s a little unbelievable to share ice cream with severe weather expert Dr. Greg Forbes, who always gets ice cream instead of cake for his birthday. Or to go out to that first after-work birthday dinner at a Mexican restaurant and see Jim Cantore stride in wearing jeans, said Wilson with a laugh. That infectious spirit is partly what keeps the staff going, especially during often hectic days and nights when there’s breaking weather news — along with plenty of chocolate and what employees fondly call “preemption pizza.” The fast-paced world of cable television is a far cry from where she thought life would take her, and Leverette couldn’t be happier about it.